Big, small, gas, oil, electric – we’ve got your water heater! We provide FAST repair and replacement service on all types of home water heaters. Most replacements can be done same day. We will remove, replace and dispose of your old water heater, and our servicemen will clean up after the job so you wouldn’t even know we were there. Here at Home Air Plus, Inc. we are licensed, experienced, professionals. We will get the job done right! Need a repair? Give us a call at Home Air Plus, Inc. We can determine if your water heater needs something as simple as a tune up to get your water heater running back at optimal efficiency. If you’re having trouble with a leaking water heater, low water pressure, bizarre sounds from your water heater, or finicky hot water, it may be time to give us a call at Home Air Plus, Inc. Some water heaters require repairs while others require replacement. We can help you determine the proper course of action and give you a reasonable estimate for the cost of repair or replacement. 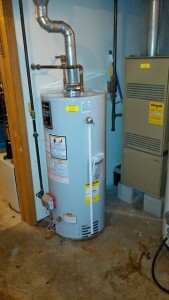 Looking to upgrade your water heater? We have water heaters of all sizes and configurations. Here at Home Air Plus, Inc., we can help determine if your old water heater needs to be replaced, and if it does, what kind of water heater will best serve you as well as be energy and cost efficient for your needs.